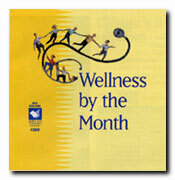 Health promotions materials for every month of the year. From Healthy Weight Week in January to World Aids Day in December, you'll be ready with health promotion material every month of the year. By linking your monthly plan to the bigger national health observation months, your messages will get the added punch of national media coverage of the topics. The year plans itself with this complete kit. Heart Disease-Are You at Risk? Breast Cancer: Who's at Risk?